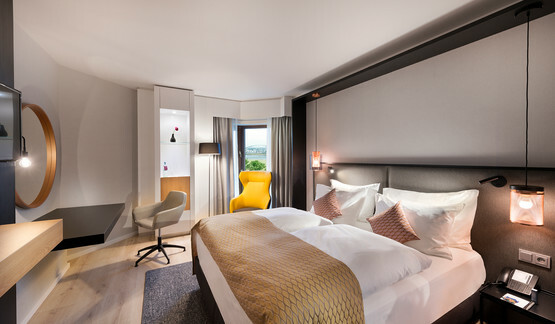 The Crowne Plaza Düsseldorf - Neuss offers you 246 hotel rooms and suites. The rooms are equipped with first class comfort: air-conditioning, safe in the rooms and Wi-Fi internet free of charge (up to 512 kbit/sec). In the hotel rooms you enjoy comfortable double or twin beds. Their size is between 24 and 32 sqm. The standard equipment includes flat screen TV, cable TV and radio. The white marble bath rooms offer bath tub, cosmetic mirror, hair dryer and hygienic products. Also benefit from our wake up service, laundry service and room service. All of our guests have access to the RiverSpa with Sauna, swimming pool and cardio machines. Are you looking for an exclusive room with top equipment for a special occasion in Dusseldorf? The suites at Crowne Plaza Düsseldorf - Neuss are perfect for honey moon, wedding nights or birthdays. Perfect business guests: Greet your business partner in the suite for undisturbed meetings. The panoramic view on the river Rhine and the Dusseldorf skyline make your stay at Crowne Plaza Düsseldorf - Neuss to something very special! ► Discover more about our suites! Our team wants to give you unforgetable moments and high quality time with your family. We are happy to feature a room with age-appropriate toys (until 10 years) so that your child will be well entertained during your stay. Our hotel offers several connecting rooms, which we will gladly reserve for your family on request. The pillow makes the night. Therefore we offer you the coice between different pillows to make your sleep comfortable and relaxed. Choose the right pillow for your needs from our pillow menu. The classic hotel rooms at the Crowne Plaza Düsseldorf - Neuss are equipped friendly and modernly and offer best comfort: hotel rooms with desk and comfortable seats, bath rooms with white marble, special cozy hotel beds. The premium rooms have a size of about 32 sqm and provide a great ambience with a huge window for an amazing view on the river Rhein. The premium rooms are special equipped with Nespresso machine, flat iron and iron board, bath robe and slippers. These premium rooms with Rhine view are perfect for guests who enjoy a lot of space and letting their eyes wonder on beautiful panorama. From the rooms you have a fantastic view over the Rhine up to the state’s capital Duesseldorf. The Rhine view rooms are well-equipped with a Nespresso machine, bath room with white marble and special comfortable hotel beds. Bath robe slippers and flat iron can be found in the rooms.